Dr Kartik Modha is a north London NHS GP, the co-founder and CEO at myHealthSpecialist.com and founder of Tiko’s GP Group on Facebook. 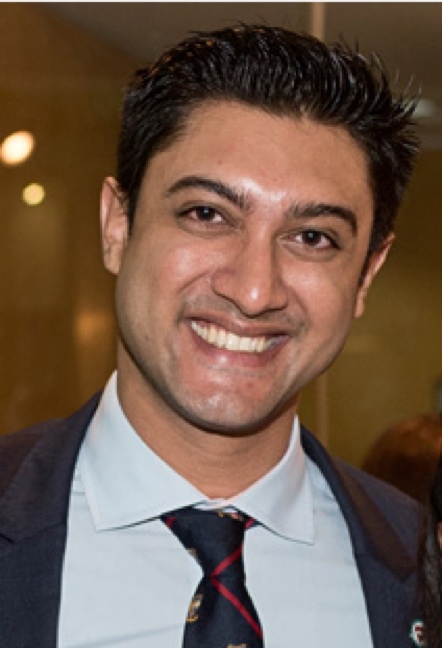 He has been listed in the top 50 most influential GPs in the UK for the last 4 years and is passionate about using technology to improve clinical connectivity and patient care. Can you tell us a bit more about myHealthSpecialist? myHealthSpecialist.com features GMC-registered specialists that have also been recommended by doctors, and connects them with patients looking for a specialist referral. We only feature peer-recommended doctors as we believe in directing patients to only the most trusted healthcare professionals. These clinicians are often those who may do very little commercial marketing, but command respect in clinical circles for their patient outcomes and dedication to their profession. 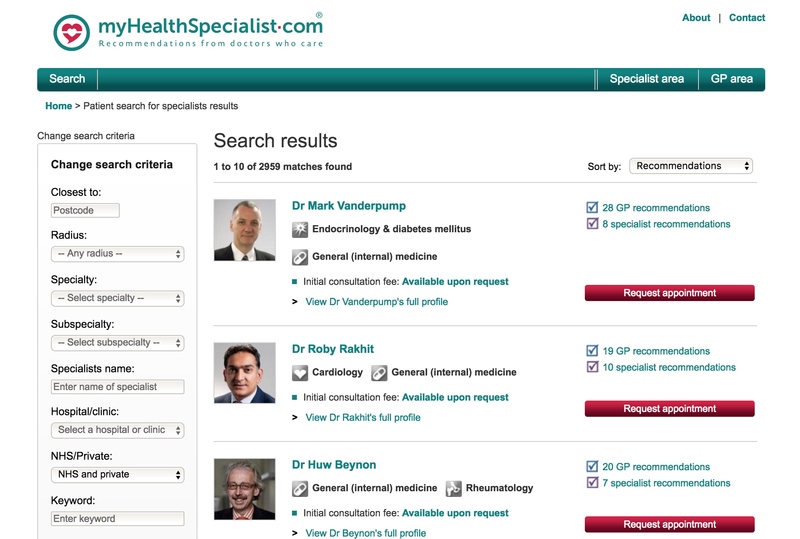 The search function allows you to search by speciality, NHS/ Private, postcode and many other filters. Why did you start myHealthSpecialist.com? I am passionate about digital health and care deeply about building clinical communities and improving patient care. When a patient needs a specialist referral, usually privately but also on the NHS, they almost always ask their GP the same question “who do you recommend?” It’s helpful if their GP knows an expert in that field but if they don’t, it leads to messages and emails to colleagues asking for their recommendations or indeed asking the patient to find out for themselves. This can be time-consuming for both patients and GPs. We started myHealthSpecialist.com to aggregate the recommendations currently existing in the minds of doctors and make them freely accessible for everyone to use. We know if doctors find this information difficult to come by, patients will find it even more difficult especially as these may relate to life changing decisions. With the help of our fantastic GP and specialist members we have collated over 6000 recommendations for UK specialists on the website, which currently receives 250,000 specialist profile views each month and helps connect thousands of patients to recommended specialists each week. This is fundamentally changing people’s healthcare outcomes, and therefore the course of their lives. There’s plenty of opportunity to innovate but be prepared to work extremely hard. You need to be passionate about what you want to create as this gets you through the tricky times. Can you describe your funding journey to date, and what advice do you have for early-stage entrepreneurs looking for funding? The beta-version of the website was launched in 2013 with seed funding from a founder team of colleagues and friends, who had a passion for health and IT and also poured in a lot of hard work. After seeing strong organic growth in 2014 a further early-stage investment round was completed in 2015 which allowed for technology updates and a team to be set up. The advice I would give early-stage entrepreneurs is to consult as many investors and successful entrepreneurs as possible. It will help refine your plan, challenge assumptions and give you a realistic idea of how to achieve your goal. What is the myHS revenue model? The website is free to use for patients, GPs and NHS consultants. For specialists and clinics wishing to publish private practice details there is a small subscription fee. For each recommendation that is shared by a GP or specialist, we make a donation to the Royal Medical Benevolent Fund, a charity which helps medical students and doctors in difficulty. Do you have a big hairy audacious goal for myHS? My dream would be for every peer-recommended specialist in the UK to be a member of myHealthSpecialist, and for it to be the first choice for every GP and patient looking for trusted specialist healthcare. You are based in the leafy suburbs of North London, unlike most startups. What are the advantages and disadvantages of being based away outside the city? Many of the team are based locally and with a short commute time it means we all spend a lot longer at work helping our users and improving our technology! We are only a short tube ride from Central London, providing easy access for meetings. Plus keeping our overheads low means we can invest more towards our users and clients needs. Being a technology company we can leverage talent further afield as well so we have members of our team located on the South Coast as well as India. That said, being based away from the city centre means recruitment is a bigger challenge and we miss out on the serendipity of a chance encounter with other technology startups and the new opportunities that may arise from this. However, this does mean fewer distractions, which is key for a startup! The advice I would give early-stage entrepreneurs is to consult as many investors and successful entrepreneurs as possible. It will help refine your plan, challenge assumptions and give you a realistic idea of how to achieve your goal. You are still a practicing GP two days a week. Does this have any benefits for myHS, or does it just help pay the bills? Besides the fact I love clinical practice and patient consultations, it’s essential to understanding our healthcare system from a frontline perspective, and in particular where technology can help and where it may be a hindrance. GPs work at a frenetic pace and are required to have a vast breadth of knowledge; it’s impossible for anyone to truly understand this if you’re not on the frontline. You set-up Tiko’s GP group a few years ago. Can you tell us more about this group? Tiko’s GP Group (TGG) is a GP-only Facebook group which I started in 2011. It was inspired by a YouTube video by Steven Johnson on ‘Where good ideas come from’, which essentially linked historic increases in innovation to increased connectivity. GPs have been historically disconnected from each other by the nature of our work and TGG aimed to reconnect us. It grew organically from 20 friends who were part of my Royal Free GP Training scheme and now has 4000+ members and facilitates 100s of interesting discussions each week. Your entrepreneurial tendencies began with an events business at university. Did this experience help with myHS, if at all? To hold regular events for up to 3000 people whilst studying medicine at King’s taught me another level of multi-tasking, team work and hard graft! These have been essential in being able to take our startup to this stage. What advice do you have for doctors and medical students considering entering the world of entrepreneurship? There’s plenty of opportunity to innovate but be prepared to work extremely hard. You need to be passionate about what you want to create as this gets you through the tricky times. Having experienced people who have done it before to discuss your ideas with is invaluable. Which healthcare startups have you come across that you are excited about? The bio-tech startups in the 3D printed organ space have made huge advances in recent years, tackling challenges such as vascularisation, and alongside stem-cell technology give genuine hope for autologous 3D printed organs within the next decade.